In a highly anticipated matchup The University School (FL) Sharks took on McEachern (GA) Indians. The teams appeared to be equally matched early with a closely scored 1st Qtr. McEachern pulled ahead late in the Qtr. With solid offense and defense from Jared Jones who led the team in scoring for the 1stQtr with 7 points. The McEachern Indians ended the Qtr leading the University School with a score of 23 to 13. In the 2nd Qtr McEachern extended their lead with points from defensive turnovers and steals lead by guard Sharife Cooper. The University School fought back ending the Qtr on a run led by Scottie Barnes and Drue Drinnon which cut McEachern�slead to 4. 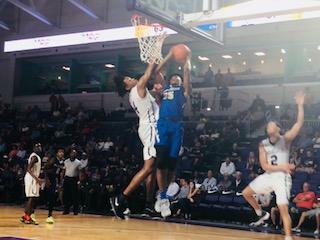 The score at the half was McEachern 35 to University School 31. The Sharks picked up where they left off at the start of the 2ndhalf with 5 quick unanswered points giving them the lead. Following the Sharks taking the lead there were several lead changes as both teams created points off turnovers. The Sharks regained the lead and finished the Qtr leading the McEachern Indians 51 to 48. Guard Dru Drinnon led the Sharks scoring 10 points in the Qtr. Both teams continued to battle in the 4th Qtr with McEachern closing the gap to 4 points with 3:04 on the clock. Vernon Carey for the Sharks took over and scored two points on a 1 and 1. Then on a rebound went coast to coast to score another 2 points. Scottie Barnes added 2 points on free throws to bring the score to 69 for the University School and 63 for McEachern. Ultimately the University School defeated the Indians with a score of 71 to 63. The University School will play East Memphis in the championship game tomorrow 12/23/17 at 7:45pm..